Visual artist Martina Galvin, musician Imogen Gunner, author Catherine Ann Cullen & choreographer Monica Munoz with Andrew Hetherington, Chief Executive, Business to Arts at DanceHouse on Foley Street for the announcement of the recipients of the 2017 Small Grants Scheme. 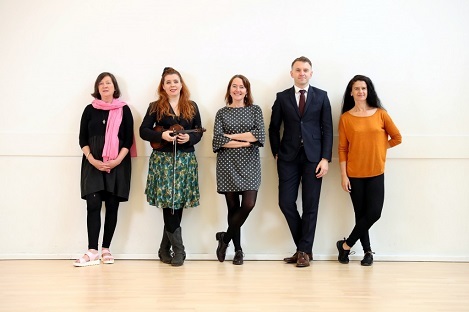 Business to Arts are pleased to announce this year’s recipients of the Small Grants Scheme under the Docklands Arts Fund. Working with Dublin City Council, the objective of the Docklands Arts Fund is to enhance and develop the appreciation of quality art experiences in the Docklands area. Martina Galvin (visual artist), Catherine Ann Cullen (author) & Imogen Gunner (musician), and Monica Munoz (choreographer) will receive €5,000 for each of their projects, which will be based in Dublin’s Docklands over the next year. The Docklands Arts Fund, is a partnership between Business to Arts, Dublin City Council and local businesses and individuals. In 2016/2017, 77 people supported the Docklands Arts Fund through donations of cash and proceeds from the sale of the annual Docklands Arts Fund Print Commission. • Martina Galvin is a visual artist, and her project ‘Coastlines, Maps and Melons’ is a visual art engagement with 3 schools in the Docklands Area. The project will include 2 visits to art galleries, 3 classroom workshops for each school, and links the second art gallery visit to National Drawing Day in May 2018. Read more about Martina’s project here. • Monica Munoz is a choreographer and performer, and her project ‘Princesses can be Pirates’ will be a new and innovative dance piece for children aged 6 – 10, created for primary school children from the Docklands area. The piece will be created in collaboration with Dance Ireland, and will be performed in early 2018. Read more about Monica’s project here. • Author Catherine Ann Cullen is collaborating with musician Imogen Gunner on ‘Street Songs and Sea Shanties for the 21st Century’, which aims to forge a new tradition of song-making in the Docklands area by giving the children in two primary schools the tools to collect local stories and ideas and to hone them into communally-written songs. Read more about Catherine & Imogen’s project here.